Recipes, cooking tips, reviews, gadget tips and other rants and raves. Cookery with attitude at times! This dish is something I thought up whilst trying to figure out a problem a customer had. I love getting paid for thinking about food. You can vary the heat in this dish to suit your own taste and preference but please don't sissify it too much. It should clear your sinuses and make wimps whimper. If you don't want to make your own marinade, use a good store bought one. I quite like Walkerswood's version of it. I actually used some of their Escoveitch pickle sauce for the garnish you can see in the picture. Start by marinating the pork fillet in a plastic bag, making sure to massage in the Jerk marinade well. Leave it for as long as you can, preferably overnight, but at least for an hour or two. Heat the olive oil in a very hot pan. In the meantime scrape off most of the marinade from the pork and reserve the marinade. When the oil is really hot put the pork into the pan. Fry for 8 - 10 minutes or until done to your liking. Make sure to rotate the pork so that you get a nice and even brown colour to it. Once done put it to the side to rest. While you are doing this you can prepare the couscous with the citrus juice(s) and coriander according to the instructions on the couscous package. Once the meat is resting it's time for the sauce. Pour in the reserved marinade into the pan together with the stock and let this boil away at a high heat. Let it reduce until you like the consistency. Strain the sauce through a sieve into a bowl or similar. To serve, slice up the meat into 1 - 1.5 cm wide slices. If you want to make it look a bit special use a food ring to layer the couscous and red onion in the middle of the plate, garnish with some Escoveitch pickles on top. 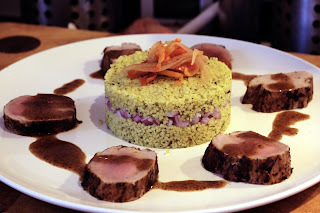 Put the pork slices in a circle around the couscous and spoon some of the sauce onto the meat. That looks great. Nice presentation too. Please leave a comment. Positive or negative - all comments are welcome and useful. I do enjoy hearing what you think of my posts, what is good and what needs improving so please post away. I'm a exiled Swede who is now living in the UK. I've been here since 2000 so I'm feeling more English than Swedish to be honest. Still, you'll find lots of Swede left in me. ;) If you want to contact me, send me an email at mike [at] freestylecookery dot com.